Get your dancing feet ready for another mind blowing Heineken® Live Your Music experience at KL Live on May 5th featuring dynamic Dutch duo, W&W. 2017 has already kicked off with a bang for Willem van Hanegem and Ward van der Harst. The lads recently released their long awaited big room banger, ‘Put Em Up’ after blasting it in their sets for the last few months. They also dropped a new remix of Ed Sheeran’s ‘Castle on the Hill’ prior to Ultra Music Festival 2017 in March, much to the delight of trance fans worldwide. The duo has also revealed that they will shift some of their focus to produce tunes under their new side project, NWYR. The acronym that stands for New Year will veer away from their current EDM influence to concentrate on purely trance tunes. They introduced their new guise at the ASOT (A State of Trance) stage during Ultra Music Festival 2017 and surprised their fans by dropping 13 unreleased singles in their 16-track setlist. W&W’s career has steadily elevated since they cracked the international market in 2007. Tunes like ‘Lift Off’, ‘Mainstage’ and ‘Jumper’ have become firm fan faves and their massive hit, ‘Bigfoot’ released in 2014 quickly rose to the #1 spot on Beatport. 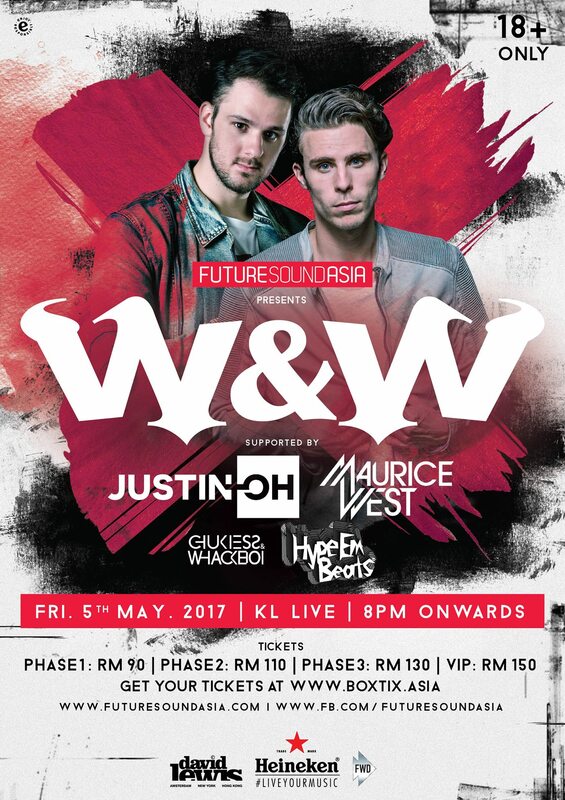 W&W’s return to Kuala Lumpur will be supported by Mainstage Music’s first signed artist, Maurice West and South Korea’s golden boy, Justin Oh. Joining them onstage are some of the city’s favourite party starters, Chukiess & Whackboi and Hypeembeats. Find out all info below.